Visit Key West, the southernmost city in the continental US, for this day trip. Enjoy the stunning turquoise water while crossing 42 bridges, including the famous Seven Mile Bridge, connecting a chain of islands and providing the feeling of sailing the ocean. While in Key West, choose from a wide variety of attractions, like the Ernest Hemingway House, the Truman Little White House, the Key West Shipwreck Museum, or take a trolley around the city. 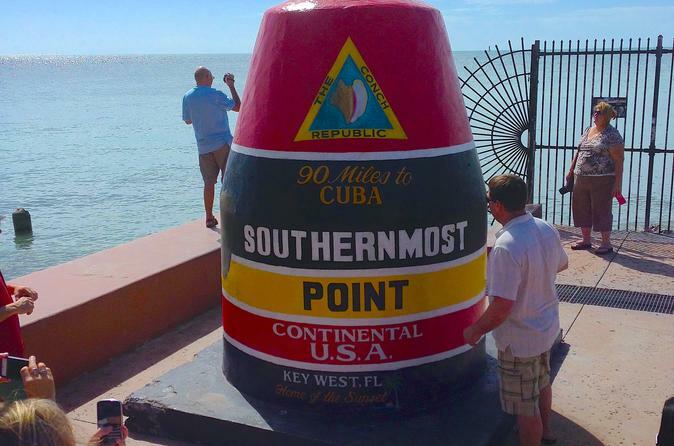 Visit the southernmost city in the continental US — Key West. The day trip begins with a Miami hotel pickup. Then, enjoy interesting facts and intriguing details about this quaint, cozy island on the 3.5-hour ride. Along the way, cross 42 bridges that connect a chain of islands in the middle of the water, the longest of which is seven miles, providing a sense of pure relaxation. The stunning shades of water color alone justify this trip. Arrive In Key West at approximately 11:30am, offering the opportunity to walk along the palm-lined streets, discover gingerbread mansions, tin-roofed conch houses, and the home of legendary writer Ernest Hemingway. Historical Americans such as Thomas Edison, Harry Truman, and Tennessee Williams spent many days in their beloved Key West. Spend the day marveling at the unique blend of Victorian, Bahamian, and New England architecture that creates Key West's colloquial atmosphere. Enjoy the shops and casual restaurants. Take the trolley through the city or rent a bicycle for a pleasant ride. With its balmy weather and crystal blue skies, this island is famous for its stunning sunset views from Mallory Square. Depart Key West at 5:30pm and arrive back in Miami at approximately 9pm. Special Offer - Book and save compared to the local supplier's prices! - Book Now!